In the State of Florida, contractors must pass both Business & Finance and Trade Knowledge examinations with a minimum score of 70%. These tests may be taken in any order, but since the Business & Finance books and study material are required for both exams (for many, but not all license classifications), it is much easier to prepare, pass, and get this exam completed first. (1) Business & Finance Exam "Computer Based Test"
This is an "Open Book Test" utilizing 3 exam reference books with 120 scored multiple choice questions to be completed in 6 ½ hours. This test is administered on computer at over a thousand testing centers across the country and students may schedule to take this exam at any location and on any date convenient for them. Our exam prep program has been designed to uniquely simulate the state testing interface so that students may practice taking tests on a computer that look and function just like the actual state exam. This familiarity gives our students a tremendous advantage on exam day. "Paper & Pencil Tests" Class "A" Contractors must pass two "Open Book Tests", each with 65 scored multiple choice questions, which must be completed in 4 ¾ hour sessions. "Computer Based Test" Class "B" Contractors (25 tons of cooling and 500,000 BTU, MAX) must pass one "Open Book Test" with 80 scored multiple choice questions, which must be completed in 5 hours. Most candidates for the Florida contractor exam have a great deal of personal experience in their trade and do not have difficulty passing the "Trade Knowledge" portion of their examination. But very few students have financial accounting experience and therefore find the "Business & Finance" portion of the test very challenging. We do NOT currently offer a Learning Program covering the Trade Knowledge portion of the Air Conditioning Contractor Exam. But, we DO OFFER our acclaimed Business and Finance Exam Learning Program for students who want every advantage in passing this exam. Our Learning Program is the most comprehensive available, we pinpoint the content currently covered on the test and over 96% of our students pass their examination on the first try. 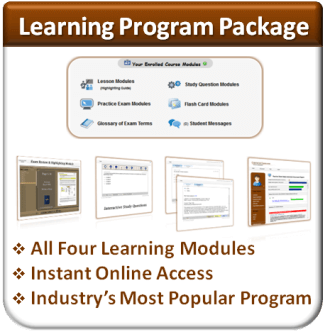 Our "Learning Program" consists of the following suite of learning modules, which may be purchased individually or as a complete package. The complete package is the most popular choice and it comes with a significant discount. Skip down to the Complete Package. Our narrated "Exam Review & Highlighting Guide" videos walk you through each of the required "Exam Reference Books", reviewing the concepts from these books that are currently being covered on the exam and explaining the problem-solving techniques that you must master to do the math problems on your test. These presentations also pinpoint "Answer Passages" to highlight and critical pages to Tab for quick location. You may review each section at your convenience, on your own schedule, at your own pace, until you have mastered the required material, and using the latest in computer-based-training technology. "We do not simply give students endless pages to read like other schools!" Watch a video for more information on this module. Our "Study Questions" are extremely realistic and will be very similar to the questions that you will see on exam day. Every question in our innovative program is accompanied by a "Hint" and "Detailed Explanation". For tough estimating and mathematical problems, we’ve also included "Narrated Solution Presentations" that are attached right to the question for your convenience. These features will ensure that you learn how to work through each problem and find the answer to each and every question on your exam. In the event that you do not fully understand any material, you are encouraged to call us at your convenience and one of our helpful instructors will be happy to review or explain any concepts you’re struggling with. Time is of the essence on exam day! The "Flash Card” Review component of our Learning Program is designed to help you develop and hone your search procedures, to select the correct reference book and pinpoint the correct answer page quickly and efficiently. This review shuffles all questions by book to challenge your skill level in picking out key words and navigating your books with confidence. 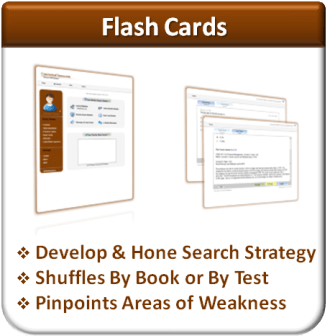 Students who train with our Flash Card Review modules are "Up-To-Speed-To-Succeed" on exam day. Unlike other schools that typically create one mock practice exam for their students, our revolutionary system randomly-generates a new set of questions each and every time you launch the module, utilizing the same content criteria the state uses to compile the real test. Upon completion, the system will generate a unique "Performance Assessment" that isolates incorrectly answered questions and provides detailed explanations to ensure students know exactly how to derive the correct answers. Easy-to-read graphs will display the student's areas of proficiency and areas of weakness. It also indicates where their speed is on target and where they are answering questions too slowly. This state-of-the-art tool gives our students a systematic approach to review and master the required material and increase their overall exam scores. Because most contractors are active individuals out and about in the field each day, the experience of sitting in a cubical for 6 hours straight, taking a computer-based state certification exam is very stressful. Especially if they have never seen or used the computer program they are being tested on. Our students have a tremendous advantage because our proprietary "Practice Exams" were designed to explicitly match the real state exam interface. It has the same look, features, and functionality so our students can practice using this program BEFORE they sit for the real deal. 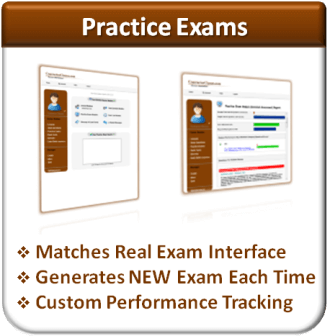 In fact, this module is such an invaluable tool that even instructors at competitive schools encourage their students to purchase our randomly-generated practice exams. Note: This is a legitimate practice exam and the student needs to set aside the appropriate amount of time to take a full and complete exam to get meaningful results. For piracy protection reason users are restricted to five opening per module. Over 15,000 students have successfully utilized our advanced home-study program to pass their exams on the first attempt, and validate the quality and success of our school every day. You are welcome to review their comments and even contact graduates yourself on our References Page. 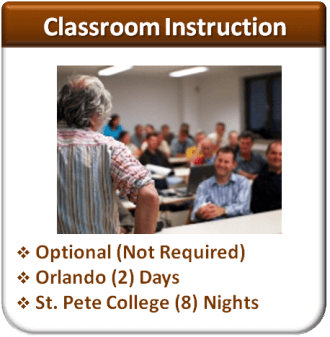 However, we also offer the same exam review lectures in a traditional classroom setting as an additional option. Our live classes are offered based on the number of interested attendees, so please call for availability. The majority of our students do not feel they need this additional review once they have completed the online program. The choices for locations and dates of the optional live classes are listed below. 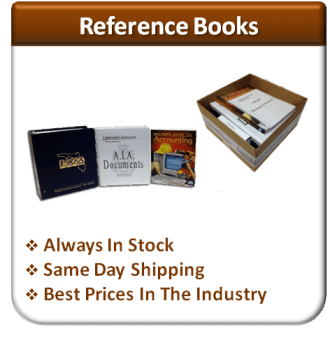 You can purchase the Exam Reference Books at a bundled and discounted price. 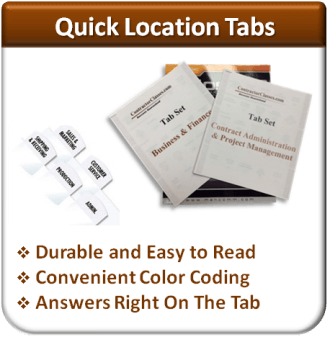 Our professionally printed tabs are absolutely the best available. 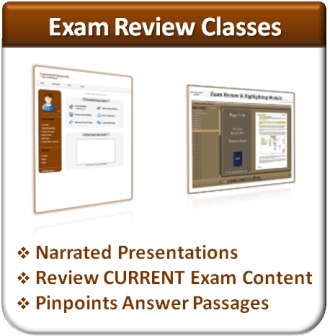 They are continually updated to reflect the most current exam content. They're also large, easy to read, and uniquely color-coded for efficient use. BLUE tabs will direct you to pages related to the common math problems and formulas you need to know. BLACK tabs pinpoint pages of common look-up questions. And, RED tabs identify pages to start a keyword search (Table of Contents, Indexes, Glossary's etc.). This instructor-developed collection of over 200 tabs will be one of your most valuable tools on exam day, allowing you to flip directly to the correct pages quickly and easily. This package is designed to give a student who already has books and tabs an all-inclusive offering of our full "Learning Program" at a bundled and discounted price. 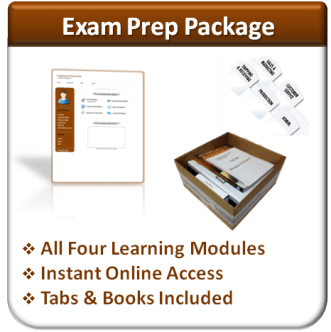 This package is designed to give a student who is just starting out, an all-inclusive offering of everything needed to pass the Business & Finance exam: our acclaimed “Learning Program” with “Exam Reference Books” and “Quick Location Tabs”, at a bundled and discounted price. For your security, all Credit Card transactions are validated through the secure PayPal processing system. You will not be required to open an account with PayPal, nor will they charge you any additional fee for this transaction. Upon shipment, an email will be sent to you with a UPS tracking number for your convenience. The above prices do not include shipping&handling or sales tax if applicable. © 2019 - Contractor Classes. All rights reserved.